My name is Nursyuhada’ Ismail, and this is the story of how and why I chose to be professional pastry chef despite having a bachelor’s degree in Qur’an and Sunnah. In Singapore, a stereotype exists for the madrasah student: that he will grow up and become one of those he used to study from — the local asatizah. I grew up in a family that strongly values Islamic education, and placing me in a madrasah was an obvious choice for my parents. Not that I am complaining; my upbringing and education was what made me fall in love with the Deen. Like other madrasah students, I went through twelve years of learning at Madrasah Al-Junied, before choosing to pursue a degree in Qur’an and Sunnah at the International Islamic University of Malaysia. Since childhood, I have always envisioned my adult self as an ustadhah. However eight years ago, I began cooking up a different dream: to practice the sunnah of running a business, and to provide Muslims with food that was not only halal, but also toyyib (good). It all began one evening when I drifted into the kitchen, carried by the scent of vanilla wafting through the household. I watched silently as my mother went from one station to another, mixing and measuring, preparing various ingredients for her examinations (she was taking a certificate in pastry-making). Never having baked before, the process intrigued me. And like all other teenagers, I took to the Internet for answers, and I experimented with all the recipes I found. From baking macaroons to whipping up pies, I spent what free time I had in between school to improve my skills and recipes, until baking evolved from being just a hobby to a passion I dedicated myself to. By the time I donned my convocation gown and had my degree in hand, I knew that I had to give attention to that which called me so strongly eight years ago — I had to follow the scent of my instincts, and get myself into the kitchen… full-time. The world of culinary arts is filled with men; professional women chefs are hard to find, even less so the Muslimah chef. In a sociological study, the researchers found that the culinary world — especially those associated with high-end dining — is a tough environment for women to get into due to stereotypes and family demands. Add a dash of secularism into the mix, and you find that wearing the hijab becomes an even bigger challenge. Fresh out of university, I stepped into a top culinary school in Singapore for an interview, carrying with me the dream I had patiently held on to. Alhamdulillah, my parents and siblings have been nothing but supportive of my plans, and I felt that this was the break that I had been waiting for the most of the last decade. My enthusiasm, however, was short-lived. Barely minutes into the interview — without taking pains to hide the fact — my interviewer matter-of-factly pointed out that my hijab was not allowed on campus. What should I do now that my dreams for the past eight years are no longer viable? What should I do now that I cannot learn the knowledge that I so passionately wanted to master? What should I do now that the school I have been aiming to enroll in does not even want me, just because of my hijab? It was one of the longest days I’ve had, but by the time night arrived, I was reminded of Allah’s subhanahu wa ta’ala wisdom from Surah al-Baqarah, verse 216: “… it may well be that you hate a thing while it is good for you, and it may well be that you love a thing while it is bad for you. And God knows, whereas you do not”. Everything had been written. I had to have faith in His plans. I was jolted awake from sleep the next morning by a knock on my door. My father stepped in. “I’ve signed you up for Le Cordon Bleu Paris; it opened a campus in Sunway University Malaysia in 2012,” he smiled. I had poured nothing but my disappointment and worry on him the night before, but this morning, he came bearing gifts instead. In his hand is a printout of a registration letter: “Le Cordon Bleu Diploma in Culinary Arts (Diplome De Commis Patissier)”. I was more than elated; after all, leaders in the Gastronomy, Hospitality and Management industries recognize Le Cordon Bleu as the world’s premier culinary arts institute! With over 120 years of teaching experience and an intensely rich heritage, the faculty at Le Cordon Bleu includes university professors, international personalities and specialists in the tourism and hospitality sectors. Moreover, Le Cordon Bleu also offers the most complete and comprehensive training in classic French culinary techniques available today, under the guidance of world-class chefs with invaluable experience in the world’s leading restaurants, hotels, and resorts. Indeed, Allah subhanahu wa taala knows what we do not. Subhanallah. Barely weeks after I returned home from studying in Malaysia, I packed my bags, bade farewell to my family once again, and set off on my journey to be a chef. Le Cordon Bleu was everything I could have dreamed of from the culinary school in Singapore, only better. From the amazing range of pastries I was to be introduced to, to the beautiful kitchens and the modern classrooms, I fell in love with Le Cordon Bleu the moment I set sights on it. 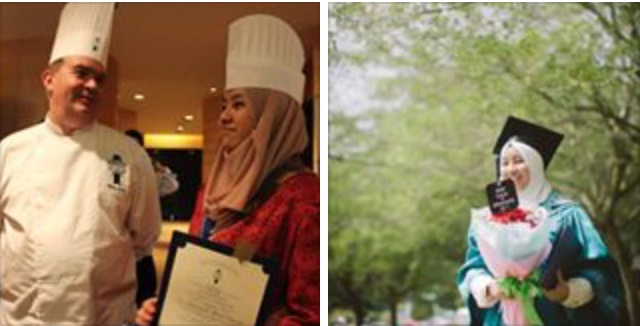 Being part of Le Cordon Bleu was amazing for a Muslimah like me; because it is located in Malaysia, all the recipes are halaal, and I was given alternative pastries to make in the event that rare alcohol-infused dishes were taught. I was given leave to make my fardh prayers, and my thirteen other classmates from all around the world — Japan, Spain, Indonesia, etc — were nothing but supportive of my practicing of the Deen. Allah subhanahu wa taala truly does not break His promise. For the next nine months, I gave all I had into learning as much as I could, and as quickly as I could, under the tutelage of Chef Thierry Lerallu whose culinary experience got him headhunted by various hotels and fine-dining restaurants worldwide. Being the only person in the room without a culinary background, I had to constantly motivate myself to keep up. Vol-Au-Vent, Mille Feuille, Milanese Pannettone, Fraisier, Madeleines, Les Verrines En Dessert — even the names of the French Pastries were as difficult as their recipes and techniques! And yet I persevered with my goal always in mind. Over time and with much practice, I began to pick up the knowledge and the skills to bake pastries that were intricate and delicate, something that I might have never been able to learn should I chose to continue learning just from the Internet. At the end of the nine months after completing the entire practical and theory examinations, Chef Thierry Lerallu served me my long-awaited diploma, and topped it up with, “Congratulations. You graduated as one of the top students in the class.” The cherry on the cake? I was chosen to represent Le Cordon Bleu in the “Battle of the Chefs” competition. After the bitterness of being rejected just for my hijab, and the struggles I had to face learning everything from scratch within nine months, Chef Thierry’s words could have not been any sweeter than I wanted to be. As I am writing this, I have just returned from the Battle of the Chefs, an international competition for chefs with over 1,000 participants. I was made to compete with other international chefs — both professional and recent-graduates like myself — as Le Cordon Bleu’s representative for the bread display category. I personally believe that there are many career routes for Madrasah students. They should explore their own talents and passion, whilst at the same time upholding the Deen firmly wherever they are. A well-developed society needs not just asatizah to function well, but also professionals who are excellent at their jobs and as Muslims. In our Muslim community especially, we are in need of Muslim professionals who are successful, both in the context of the Dunya and Akhirah. PS: Do follow Patissier On 77 on fb/instagram!